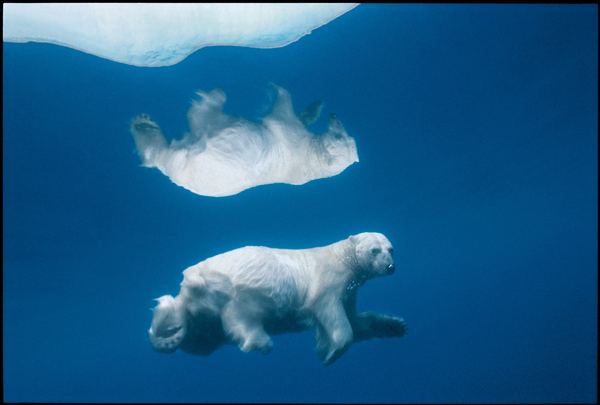 Paul Nicklen is a world-renowned Canadian wildlife photographer best known for his 15 years of work for National Geographic magazine as a specialist in Arctic and Antarctic environments. He’s brought readers stories of face-to-face encounters with polar bears and leopard seals, all the while drawing attention to the dangers of climate change. Nicklen will be in Montreal this coming Wednesday, May 28, at the Centre Mont-Royal auditorium, to give a free public talk titled “Polar Obsessions” as part of the Genomes to Biomes conference. Paul Nicklen is a world-renowned Canadian wildlife photographer best known for his 15 years of work for National Geographic magazine as a specialist in Arctic and Antarctic environments. He’s brought readers stories of face-to-face encounters with polar bears and leopard seals, all the while drawing attention to the dangers of climate change. BBC has named him one of the world’s top 40 most influential outdoor photographers and he was a featured speaker at the 2011 TED talks conference. He has received over 30 prestigious international honours, including numerous World Press Photo awards for photojournalism. Nicklen will be in Montreal this coming Wednesday, May 28, from 6:30 p.m. – 7:30 p.m. in the Centre Mont-Royal auditorium, to give a free public talk titled “Polar Obsessions” as part of the Genomes to Biomes conference, co-hosted by McGill and five other Quebec universities. In advance of his talk, Nicklen spoke about his unique background and passion for the polar environment. You grew up in an Inuit community on Baffin Island, Nunavut. What drew your family there and what was daily life like? Was it this upbringing that has drawn you into a lifetime of polar work? My parents moved there in 1973. My dad was a heavy-duty mechanic hired to keep the town’s generators going and my mom was a schoolteacher. They went for a year of adventure and ended up staying for 12 more years and then spent 17 in Yellowknife, after which I lived for 14 more years in the Yukon. Life there was amazing. When we lived in the Kimmirut (Lake Harbour) community, Baffin Island, there were 190 Inuit people and we were one of four non-Inuit families. When you grow up in that culture with no telephone, no radio, no computers, you have essentially nothing keeping you indoors. We spent all our time outside. The ice and the snow were my sandbox and the Inuit were my teachers. During that time, I was learning survival skills that would go on to help me work as a photographer in severe polar conditions. My childhood made me extremely comfortable in the Arctic environment, which would help me later on to go back up there and work while not being threatened or intimidated by the extreme cold. Another thing I love about the Inuit culture is that it’s very creative artistically, the silk screens, soapstone carvings and lithographs – all these different creative processes that helped me to learn to use my hands and tie ropes and how to build things at a very young age. I find it tragic when I see young kids these days just sitting there idle – texting, staring at their iPhones and their iPads when they could be out exercising and learning to be creative. You’ve called yourself an “interpreter” of climate change – you translate the messages of scientists’ research into images that the public can relate to. How much of your own scientific background as a biologist goes into preparing for each shoot? I went to University of Victoria for marine biology and when I graduated I went up north and got a job as a biologist working with polar bears. But I found it wasn’t the most efficient way to engage people to combat climate change. I believed in the science and what we were trying to discover but I was frustrated that we’d spend millions of dollars and come back with a little data set that didn’t get shared beyond the scientific community. I felt very ineffective unless I could bridge the gap between the important scientific work beyond done and engaging the public in a big way. It was after this insight that I realized I had a mission in life – to get into National Geographic as a journalist and reach as many people as possible. We’re inundated with newspapers and science that says, “ice is disappearing” but you kind of turn off to it after a while. It’s left-brain information that you hear over and over and it can feel discouraging. But if you can come back with a picture of a polar bear stranded on a piece of ice drifting out to sea then all the sudden the information hits people on a different level. It taps into them emotionally and it transports them directly into the issue unlike the dry, cold numbers. As for specific scientific knowledge used in each shoot, I would say probably very little. Whether you know the Mann–Whitney U test or other statistics, or whether you understand the detailed anatomy and physiology of an animal – none of that really factors in when creating the artistic image. What factors in is a deep appreciate for wildlife. But science must have something to do with it. When I look at a polar bear, I don’t just look at its cuteness – I’m thinking about population densities, home range – all the different aspects of that species that makes it amazing biologically to survive in these conditions. That appreciation of it comes out in my photography. I do think my understanding of their behavior is paramount in capturing the moment. I have a deep respect for that animal and I listen. I watch its body language and let it dictate the encounter. There’s a great synergy between learning the patience from the Inuit and learning the science of the animal, and I think both have proven to help. You’ve thrown yourself into the water with polar bears and leopard seals – the apex predators of the Arctic and Antarctic respectively. Given the potential hazards to your own personal health, what special precautions do you take? This is where I work a lot with the professionals in the field. 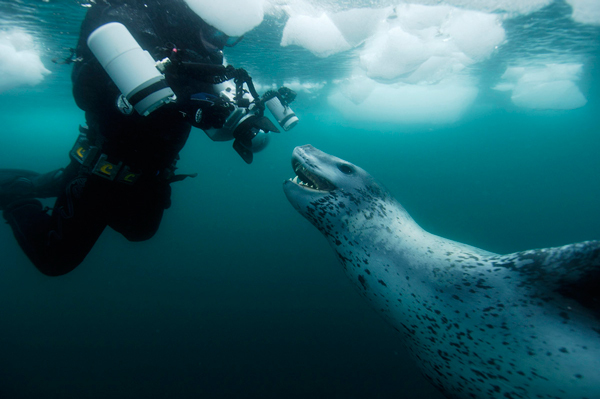 When I went to go photograph leopard seals in the Antarctic, I went with an expert who had been in the water with them before so I followed his lead. It’s the same sort of precautions when photographing the Atlantic Walrus or diving with orcas in Norway. I’m not always the first person to do it but I always give animals the benefit of the doubt. We just had this big, 200-foot underwater cave-diving discovery of the ancient, 12,000 year-old remains of the teenage girl ‘Naia’ and I think the most dangerous part of that whole trip was the drive to the dive site. You go into these sorts of situations pretty calculated – you assess your risks. It’s when you cowboy-up and do stupid things that animals bite you. That being said, I am a risk taker. I’ve crashed two ultra-light airplanes, I’ve fallen through the ice multiple times, and I’ve been trapped under the water in my plane upside-down. I’ve broken tailbones in plane crashes and dislocated my shoulders and had frostbite about 20 times. People panic when you say you’ve had frostbite, but they’re out getting sunburned at the same time and that isn’t much different – they’re just not used to it. The environments you work in are often harsh and unforgiving. Operating in the cold, and particularly diving in the ice requires a level of technical training that goes beyond the average SCUBA certification. Add to this the difficulty of artistic image composition while underwater. What comes first, mastery of outdoor technical training or mastery of photography? Imagine that you have to go to the Arctic: it’s -20°C outside and you’re freezing. Now you have to put on dive gear and you get even colder standing on the ice and then you have to slip into the freezing water. You’re now in a foreign world and you’re essentially trying to stay alive and function at that temperature. Not only do you have to carry a 20-pound camera and push that around in front of you and take your attention off your safety, but now you have to shoot images for the most discerning magazine in the world. And they better be good or else you’re not going to be working there very long. So that’s the hard part. Working backwards, you need to be an incredible diver – imagine working in caves 200-feet deep, in the dark, and you have to understand your gear so intimately that you can operate your entire underwater camera in the dark with your eyes closed. When you do the rebreather training you need to dive and operate in caves and survive – including in accidental situations where you’re getting caught in lines or lost. You have to feel so comfortable with your diving abilities and your photography that when you get into position where something amazing is happening you need to lose yourself in the artistic process. You need to shoot art while not being encumbered by the logistical nightmares of trying to survive. You have to get so good at the logistical stuff that the creative process can happen naturally. Your upcoming talk at the Genomes to Biomes conference is titled ‘Polar Obsessions’ and is open to the public. If there were one thing you hope the audience takes away from the talk, what would it be? Well hopefully I’m going to entertain everybody – I’m going to make them laugh, I’ll make them cry, I’ll make them care, but most importantly I want people to all leave that talk and look inwards and realize that waiting for somebody else to solve this problem is not going to work. We all need to do our part. We need to look inwards and alter our own behavior and we have to be willing to talk about it. It’s a much easier sell to a Canadian audience like this. It’s when I’m in China, Singapore, Russia or the U.S. that people look at you dumbfounded and go “what do you mean I’m supposed to do something about it?” It’s like when you went to go see Rocky and you walked out of the movie theatre punching your fist in the air. I want people to walk out of the talk and do something about this now, or ultimately we are going to see the loss of ice and polar biodiversity. Michael Becker is a PhD Candidate – Polar Ecology in the Department of Geography. Can the same world of “science” that denied the dangers of their pesticides also be capable of riding the back of “climate blame” by saying only “could be” and “95% certain” for another 32 years? Only science, not a mob of determined “believers” can have certainty before we condemn our children to a global crisis. My children deserve more than just “maybe”. So you can call three decades of “95%” anything you like but don’t call it sustainable and don’t tell kids that science “believes” as much as you remaining “believers” so eagerly do. Now who’s the “neocon”? Just as we defer to the medical profession if we are sick, what the causes are, and what the cure could be, so should we defer to the professional climate scientists to determine whether our climate is sick, what the reasons are, and what the cure could be. If 97% of doctors tell us to quit smoking what should we do? Keep smoking and get all philosophical that “consensus is not proof”, or should we defer to their expertise and quit?